Patent pending technology allows CobraCo flower box and pot holders to adjust to fit any size railing. The CobraCo 24 Inch White Adjustable Basic Flower Box Holder is so easy to use and comes in a black finish. 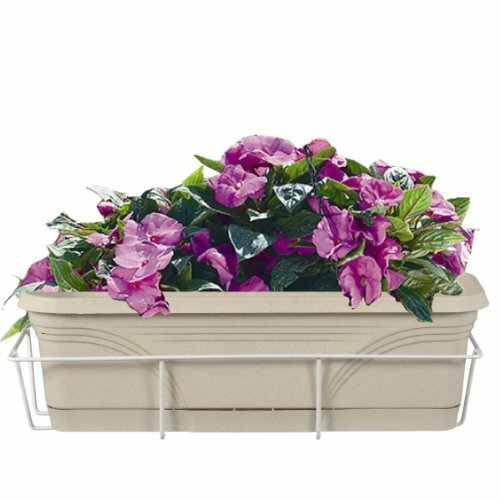 It holds up to a 24 inch box so it can be used with a variety of flower box sizes and it adjusts to any railing. Use the short end of the enclosed L-shaped clasp for 2 inch to 4 inch railings (wrought iron, aluminum or vertical wood). Use the long end for 5 inch to 6 inch railings (2 inch by 4 inch to 2 inch by 6 inch railings). With so many ways to display your flowers and plants, you can add beauty to any deck or porch railing. If you have any questions about this product by CobraCo, contact us by completing and submitting the form below. If you are looking for a specif part number, please include it with your message.